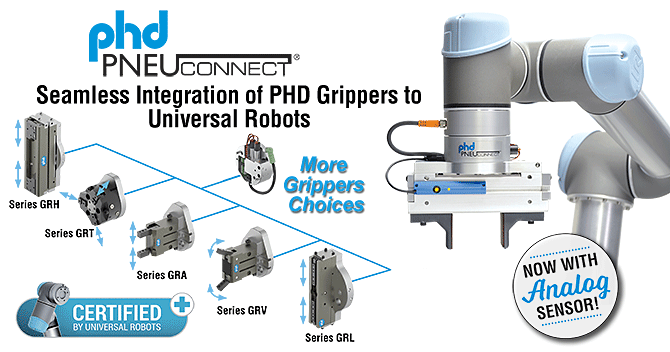 PHD Pneu-Connect® is a cost-effective system providing seamless pneumatic end-effector integration for Universal Robots. Pneu-Connect® features embedded directional control valves for control of an end-effector through the robot’s tool port. The system easily attaches to the robot arm and is intuitively operated from the Universal Robot interface via the Pneu-Connect® URCap software package. Five models of PHD pneumatic grippers are currently offered providing for a wide variety of applications. Additionally, an analog sensor choice is now available for the Series GRH kits. The analog sensor provides jaw position feedback for increased programming functionality. 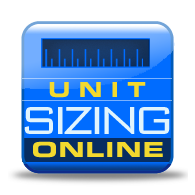 The power density of pneumatics allows for a superior performance to weight ratio when compared to some electric alternatives. This inherent property allows for lighter, non-payload robbing end-effectors, ideal for robotic applications. Additionally, when properly controlled, the compressibility of air provides intrinsically safe, back-drivable actuation capability. The Pneu-Connect URCap and included pre-made programs work best when all files are placed on the drive directly, without being contained within a folder.